Published in ACS Applied Materials & Interfaces and partially funded by the Virginia Tech Institute for Creativity, Arts, and Technology, the team's research demonstrates how a vertical array of parallel wires may change the forecast for fog harvesters. In a design the researchers have dubbed the "fog harp," these vertical wires shed tiny water droplets faster and more efficiently than the traditional mesh netting used in fog nets. "From a design point of view, I've always found it somewhat magical that you can essentially use something that looks like screen door mesh to translate fog into drinking water," said Brook Kennedy, associate professor of industrial design in the College of Architecture and Urban Studies and one of the study's co-authors. "But these parallel wire arrays are really the fog harp's special ingredient." Fog nets have been in use since the 1980s and can yield clean water in any area that experiences frequent, moving fog. As wind moves the fog's microscopic water droplets through the nets, some get caught on the net's suspended wires. These droplets gather and merge until they have enough weight to travel down the nets and settle into collection troughs below. In some of the largest fog harvesting projects, these nets collect an average of 6,000 liters of water each day. However, the traditional mesh design of fog nets has long posed a dual constraint problem for scientists and engineers. If the holes in the mesh are too large, water droplets pass through without catching on the net's wires. If the mesh is too fine, the nets catch more water, but the water droplets clog up the mesh without running down into the trough and wind no longer moves through the nets. Thus, fog nets aim for a middle ground, a Goldilocks zone of fog harvesting: mesh that's not too big and not too small. This compromise means nets can avoid clogging, but they're not catching as much water as they could be. "It's an efficiency problem and the motivation for our research," said Jonathan Boreyko, assistant professor in the Department of Biomedical Engineering and Mechanics in the College of Engineering. As a co-author of the study, Boreyko consulted on the theory and physical aspects of the fog harp's design. "On average, coastal redwoods rely on fog drip for about one-third of their water intake," said Kennedy. "These sequoia trees that live along the California coast have evolved over long periods of time to take advantage of that foggy climate. Their needles, like those of a traditional pine tree, are organized in a type of linear array. You don't see cross meshes." 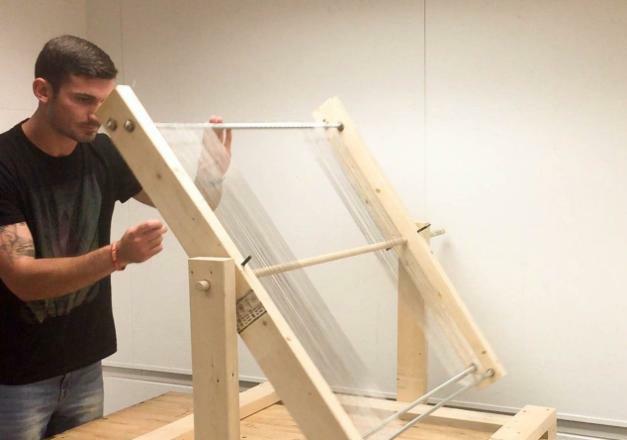 Mark Anderson, a study co-author and then-undergraduate student in the Department of Mechanical Engineering, built several scale models of the fog harp with varying sizes of wires. Weiwei Shi, a doctoral student in the engineering mechanics doctoral program as well as the study's lead author, tested the small prototypes in an environmental chamber and developed a theoretical model of the experiment. Through its unique combination of science and design, the researchers hope the fog harp will one day make a big impact where it's needed most – in the bottom of the water bucket.